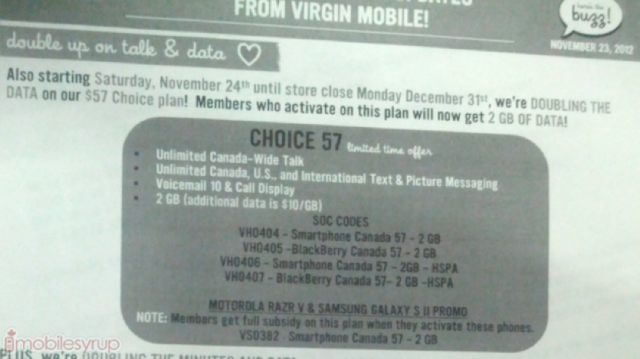 Similar to Koodo and Fido, Virgin has adjusted their $57/month plan to offer the same features as their competitors. Effective today, the Choice 57 plan includes Unlimited Canada-wide talk, Unlimited Canada/US text and picture messaging, Voicemail, Caller ID, and doubles-down on the data to now offer 2GB (was previously 1GB). According the internal doc we received it states this plan will be in place until December 31st.